For the first time since 1998, Porsche is set to field contenders in this year's 24 Hours of Le Mans. With a 911 RSR and the 919 Hybrid, they will attempt to one-up Audi, their corporate cousins who have dominated the race for years. Here's a closer look at their cars. The cars may look plain at first glance, but when seen from the top — where they partially spell out "Porsche Intelligent Performance" — you get an idea of how intricate and stunning they really are. I actually like the clean black-and-white color scheme too. It may not be flashy, but it's elegant and simple. Let's start with the 919 Hybrid. It's powered by a 2.0-liter 500 horsepower V4 (yes, V4) with a hybrid electric drive that can spin up to 9,000 RPM. The prototype is efficient too, with two energy recovery systems: one that recovers thermal energy from exhaust gases via an electric generator driven by the exhaust gas stream, and one from the 918 Spyder that converts kinetic energy into electric energy that can be sent to the front wheels at will. As for the 911 RSR, it puts out 470 horsepower. Last year it finished first and second in its class at Le Mans, and in January it won a class victory at Daytona. In other words, it's proven, it's fast, and it looks awesome. 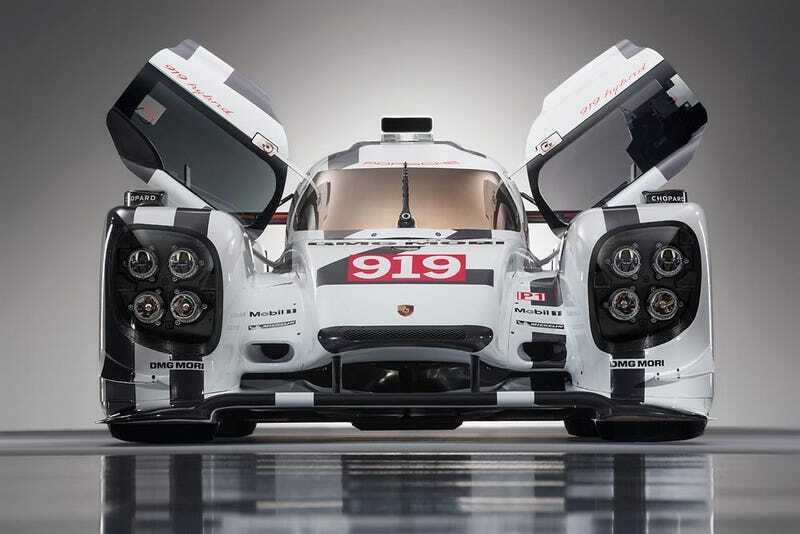 All eyes will be on Porsche at Le Mans this year. I, for one, am looking forward to this family feud.